In the old days, bike fitting was pretty simple. Someone asked how tall you were and they gave you a couple of frame size options. Actually in the old, old days, there were only four frame sizes (19,21,23 and 25”). One of the reasons for that was forks were fully made of steel. Since then, bike fitting has become more of a focus, and with good reason. The bike that fits you better will be more comfortable and perform better (although not necessarily both). The emergence of the full carbon fork changed everything because the handlebar can only be about 40 mm above the head tube. This means you can’t raise the handlebars any more than that. Also, in the old days, people bought frames by seat tube length – which has some value but misses some key points. About 10 years ago, a new concept was introduced, using the terms stack and reach. 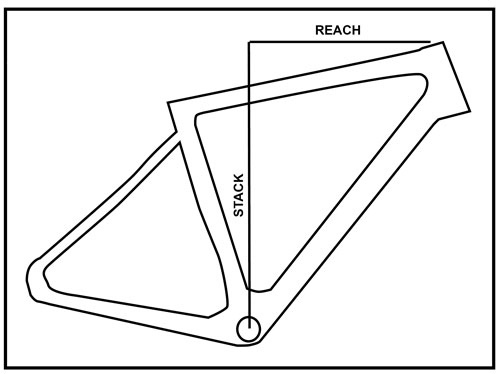 The stack and reach formula focuses on the fitting of the front end of the bike. The introduction of carbon compact frames also has a lot to do with it because they can be made with very few, if any real solid points of measurements. To understand stack and reach you should understand how bike fitting works. Saddle height and position are all relative to the crank. To get the most power, your knee cap should be roughly over the pedal spindle with both the crank arm and you upper leg parallel to the ground. That will give you your rough saddle height. If you change your saddle height higher or lower it will change the angle of your upper leg. The stack height is also critical because it determines how high you can raise your handlebars. If it’s too low you won’t be able to get the handlebars up high enough. Handlebar height is maybe the most important factor in bike fit. The higher the bars, the less weight you put on your arms (and therefore hands) and the easier it is on your neck and lower back, and the more stable you are. But you lose speed because you are both less aerodynamic and the angle between your torso and legs is larger. Pros, riding at 25 mph, would be giving up as much as a couple of mph because of it – that’s why they don’t do it. The lower the bars, the reverse. So go-fast riders like to see the bars 3 or 4 inches or more below the saddle because it gives them the most power and is more aerodynamic. Bikes have been traditionally made to fit the go-fast riders. So you normally see a recreational rider riding with the bars jammed up as far as possible and they’re still in discomfort because they can’t get them high enough. Two of the greatest racers of all time with very different positions on traditional flat top tube steel frames. 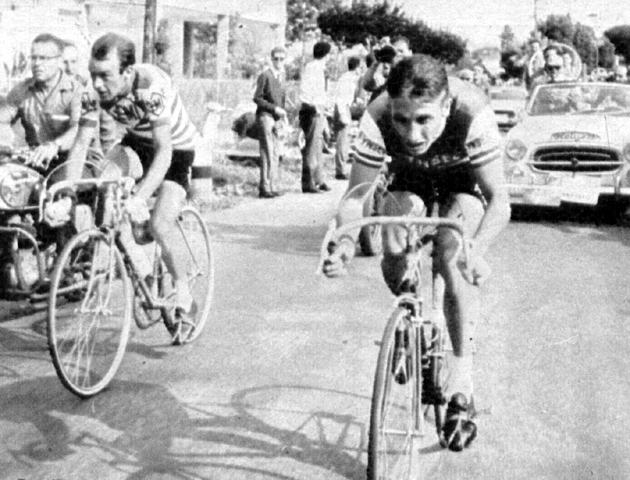 On the left is one of cycling's finest climbers, Charly Gaul. Note his back is nowhere near flat. And on the right is the supremely aerodynamic Jacques Anquetil whose back was like a table when he was at speed on the drops. The way frame makers affect stack height is by head tube length. The longer the head tube, the higher the bars. Most recreational riders like the bars saddle-height or about an inch lower. Long distance riders also tend to like higher bar heights. Reach is somewhat just a function of how close you can get the front wheel to the crank arms. In most bikes about 54 cm and up you have clearance for your feet but in the smaller frames there is overlap with the front wheel. Reach can also be adjusted with various stem lengths. Notice also that as the stack height increases the reach decreases, which for most people a more vertical position is preferred – but for the go-fast people the lower the stack height is, the longer the reach – which is normally what they want. Unfortunately few bike shops (probably even very few) understand these elements when selling a bike and most would not have a clue if you brought up these issues. This is not entirely their fault, these are somewhat new concepts and bike companies sell them frame sizes. While some geometry charts mention stack and reach, I am not aware of any that sell by stack and reach. In any case, currently doing so would not make sense because very few people think in those terms. So if you go to buy a bike, and the shop doesn’t understand stack and reach, you can still get the same effect by getting on the bike and seeing how high the bars can go. For about 95%+ of the 1000 people or so I have sold bikes to, that’s the biggest issue.